Did you know, that you can search codepoints directly from within your browser? 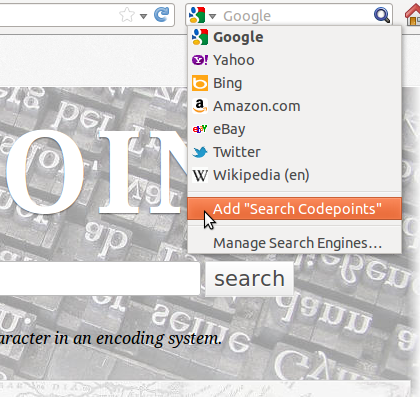 In IE and Firefox you can add the Codepoints.net search as simply as clicking an “Add Search” button. The technology is called OpenSearch, and it allows you to place the codepoint search in a row with Google, eBay and the others usually pre-installed in your browser. On the OpenSearch website you get detailed pointers how to use these features in your favorite client. In Firefox, click in the upper-right search box on the small triangle and click then ‘Add “Search Codepoints”’ to install the codepoints search.